After a bright and sunny first 13 days on the road, Mother Nature determined we’d had too easy of a time so far and decided to make things interesting. Torrential wind and rains met us in New Mexico and Arizona on our way west, along with flash floods and black ice. After having some fun driving in 4-wheel through the mud, we navigated through the obstacles and arrived in Los Angeles on Saturday night, in time to connect with old friends and make some new acquaintances and contacts. The beginning of the week brought a return to business, with visits scheduled to more prominent surf and outdoor shops on Monday and Tuesday. Our confidence buoyed by the success of the past two weeks, we excitedly met with owners and buyers in the San Diego and North County areas to discuss our product, marketing, terms, pricing, and all sandal related topics. Visits with three very well-respected shops resulted in three more important letters of intent, and a happy and successful end to our schedule. With the retail portion of our trip wrapped up, we started the long drive back to our homes on Wednesday. With families and kids’ hockey lessons waiting for us, two well-rested drivers ready to split the driving duties, and a makeshift bed in the back of the truck, there was nothing standing in our way. Except, of course, Mother Nature. The first day went smoothly enough, but nightfall in Northern Arizona brought the first snow, and it kept on through the night and into the next day. Thursday during the day brought us through the Texas Panhandle and into driving winds and heavy snowfall. Visibility near zero reduced our speed to around 25 mph, and the threat of closure on I-40 kept us moving for fear of getting stuck and unable to get back on our way. 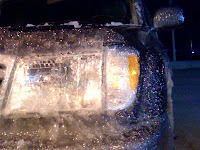 Once the snow cleared, we could see the half-inch of ice that covered everything from our headlights, surfboard bag on the roof, and windshield, to the road itself. Another few hours of 25 mph driving on the interstate ahead of us, we kept moving and finally outran the storm somewhere in Oklahoma. Once ahead of it, we dared not stop, and so we kept moving until we hit home late on Friday night. Tired and road weary, we’re able to look back on a successful trip and prepare ourselves for the next steps. Having proven the market for our product on a consumer level through our focus groups, and then proven the retail market for high quality, domestically manufactured sandals made with an eye to the environment through our recent retail visits, we turn with optimism toward securing the financing necessary to get our production facility up and running. We genuinely look forward to getting those first sandals rolling off the line, and taking the next step on the journey we set off on last year. As we said in our first post – we’re a long way from our goal, but now we’re a lot closer to that starting line.